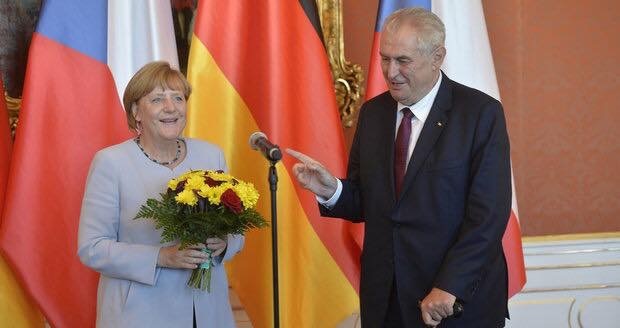 Home Merkel V4 Report: EU calls on Czech President Zeman to Cooperate. Typical arrogance from Donald Tusk in Brussels, treating leaders of nation states as if they were high school pupils. In reality, the EU is looking for submission, not cooperation. This is why the Eurocrats backed Zeman’s opponent in the election. Contrary to what some in the media write, Visegrad will cooperate when merited; however, they will not just “roll-over” like Sweden. If their beliefs and national interests are challenged, they will defend their people, culture and sovereignty. This is how strong and confident leaders act. Brussels and the leaders of Western Europe may want to start listening to Visegrad instead of lecturing them. The former Polish prime minister, who has enraged Polish citizens for using his EU position to launch political attacks against the ruling government in Poland, now says he wants the EU to “better respond to European citizens’ concerns” regarding immigration. Tusk, like others in Brussels, may be alarmed at the recent voting trends in Europe. However, with the elections in Italy on the horizon, we believe this is more empty rhetoric from Tusk. The head of the EU’s executive European Commission, Jean-Claude Juncker, echoed Tusk’s appeal for cooperation. “In an increasingly polarized and complex world, we need to build bridges within and between countries,” he wrote. Agree, but mandatory migrant quotas and the slanderous attacks directed at Hungary and Poland act as dynamite and will further divide Europe. It is Brussels which must “back off” from their demands, which often intrude on the sovereignty and independence of the nation states. Later on Monday, Juncker was due to host Czech Prime Minister Andrej Babis, who has support from Zeman as he struggles to form a government following a parliamentary election in October. While Babis is expected to reassure Juncker that Prague remains dedicated to the EU, he will also make clear he will not accept forced migrant quotas from a Italy or Greece. The failure to secure the external borders has not only bitterly divided Europe, but has also exposed Europeans to great danger. The EU is foolish to believe they will receive cooperation from Visegrad if, in the words of EU Minister Dimitris Avramopoulos, they attempt to “commit” Europe to mass migration. The same can be said regarding Poland and Article7. Zeman, Viktor Orban and the leaders of Poland have nothing to explain or apologize for. On several occasions, they offered troops and specialists to help secure the borders in Greece and Italy but were rebuffed. Visegrad may not subscribe to the “group think” of Brussels, but they answered the bell and took the tough but necessary measures to protect their people and nations. Defiance in defense of a just cause is often both necessary and healthy. It is the Chancellor of Germany who must take the responsibility for her reckless rhetoric and decisions regarding migration. She can start by showing her gratitude to the states who secured the Balkan route, which cut the migrant demand for Germany. She also may try listening to others outside of Berlin or Brussels. The momentum in Europe has shifted. Onward V4! Prime Minister Mateusz Morawiecki: Poland does not share responsibility for the Holocaust.